Background and Objectives: Cigarette smoking is one of the major global health issues. Accurate measurement of smoking is essential for accepting patterns of adolescent smoking behavior and for the evaluation of health education programs aimed at reducing or preventing the habit. The aim of the present study was to estimate and compare the salivary thiocyanate levels in young adult smokers and nonsmokers and also to evaluate and correlate the cellular and nuclear changes in cytological smears with salivary thiocyanate levels. Materials and Methods: The study included a total of 70 individuals in the age range of 18–25 years comprising of 35 smokers and 35 nonsmokers. A volume of 2 ml unstimulated whole saliva samples were collected by spitting method and were carried in a vaccine carrier with ice pack to the laboratory to avoid biochemical changes. Each sample was analyzed on the same day of collection by spectrophotometric method. In addition, cytosmears were prepared using Cytobrush® plus and stained with rapid Papanicolaou stain for cytological evaluation. 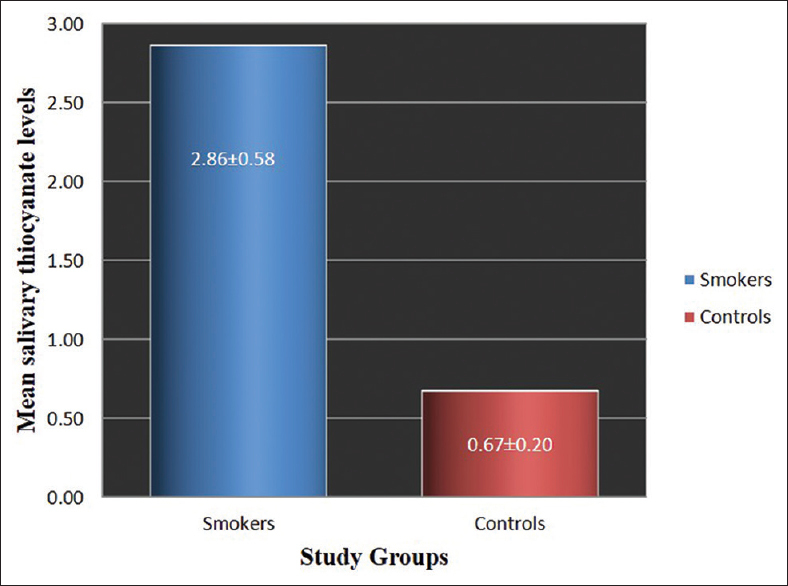 Results: Salivary thiocyanate levels were significantly higher in smokers than nonsmokers. When these levels were compared with pack-years, there was a progressive significant increase in salivary thiocyanate levels as the pack-years increased. Duration of habit showed no statistically significant effect on salivary thiocyanate levels. Cytological evaluation revealed increase in nuclear-cytoplasmic area ratio and number of micronuclei in smokers than nonsmokers. The correlation between salivary thiocyanate levels and cytological changes showed insignificant result. Conclusion: Salivary thiocyanate levels were significantly higher in smokers than controls and showed significant correlation with the number of pack years. Although the present study failed to reveal any significant correlation between salivary thiocyanate level and cytological alterations, few early alterations in the oral mucosa even in the absence of clinical manifestations were detected by exfoliative cytology. Salivary thiocyanate determination is a safe, inexpensive, noninvasive method to differentiate early smokers from nonsmokers. Tobacco and alcohol are the major avoidable etiological factors for oral cancer. Tobacco smoke is made up of thousands of chemicals some of which are known to be mutagens and carcinogens. Carbon monoxide, thiocyanate, nicotine and cotinine are essential serum markers of smoke inhalation. Each cigarette delivers 30–200 μg of hydrogen cyanide into the mouth of the smokers. Hydrogen cyanide is metabolized by the liver to thiocyanate., In addition to cigarette smoke, thiocyanate is also present in certain foods, but salivary thiocyanate levels are not affected by alimentary sources such as cyanogenic food  or even chewed tobacco. Cigarette smoking is considered as a socially unacceptable behavior due to which there is denial or under-reporting of this habit among the youth. The determination of physiological levels of plasma thiocyanate and salivary thiocyanate has been used for distinguishing smokers from nonsmokers, but studies are scant. Saliva can be used as an alternative to plasma in identifying smokers as well as in monitoring the progress during de-addiction therapy due to the ease of performing the test with minimal risks. Tobacco is known to cause cytological alterations in oral mucosa, the early changes of which can be easily identified by cytology of oral epithelial cells. Cytology is suitable for routine population screening programs for oral cancer. Studies determining salivary thiocyanate in chronic smokers have been reported in the past, but studies in early smokers are few. Also studies to determine the association between salivary thiocyanate levels and cytological alterations in oral mucosa of smokers are scant. Thus, the present study aimed at estimating the salivary thiocyanate levels in young adult smokers and nonsmokers and to compare and to correlate the levels with the cytological alterations in oral mucosal epithelium. A total of 70 individuals were included in the study. Cases consisted of 35 young adult smokers belonging to the age group of 18–25 years who were habitual smokers (minimum 5 cigarettes/day) with no other habits and the control group consisted of 35 nonsmoker healthy volunteers. Individuals with other habits such as alcohol intake, tobacco chewing and systemic diseases such as diabetes mellitus, hypertension and anemic patients were excluded from the study. A detailed case history was recorded. Informed patient consent and institutional ethical clearance were obtained. Patient's smoking history (number of cigarettes smoked, duration of smoking) was noted in pack years. Pack-year is a way to measure the amount a person has smoked over an extended period. It is calculated by multiplying the number of cigarettes packs smoked per day by the number of years the person has smoked divided by 20 (1 pack has 20 cigarettes). A volume of 2 ml of unstimulated whole saliva was collected by spitting method in a sterile container. 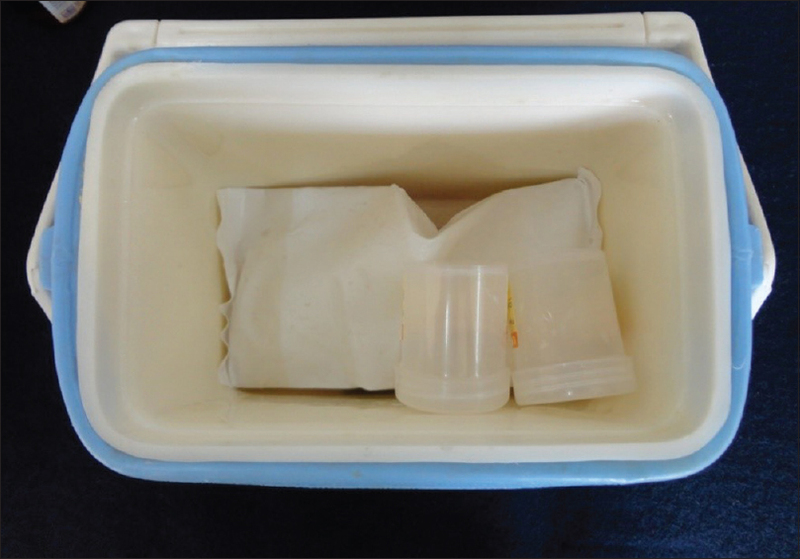 The samples were carried in a vaccine carrier with ice pack to the laboratory to avoid biochemical changes [Figure 1]. Each sample was analyzed for salivary thiocyanate level on the same day of collection by spectrophotometric method. Then, the solutions were measured at 447 nm wavelength using ultraviolet spectrophotometer (UV-VIS Systronics 117) [Figure 2]. Cytosmears from buccal mucosa were prepared using Cytobrush ® plus and were stained with rapid Papanicolaou stain and were analyzed for cytological alterations. 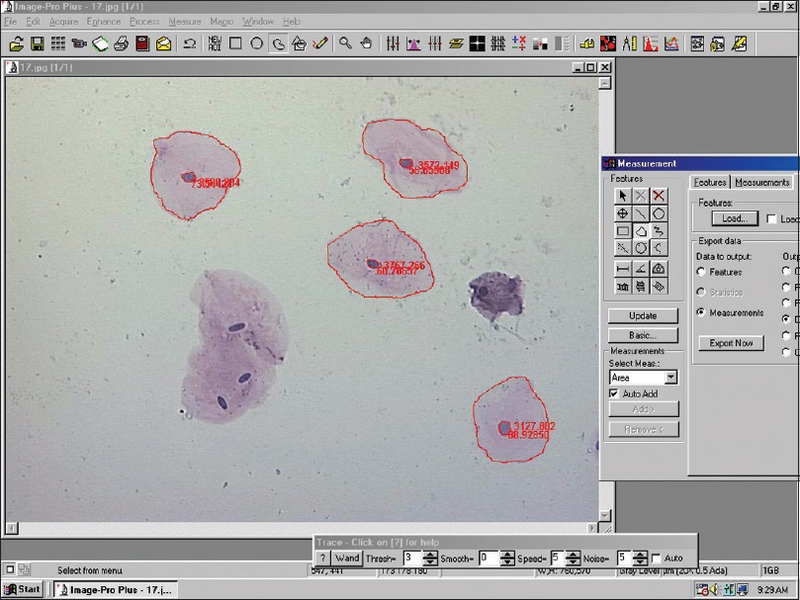 Stained cytosmears were observed under Trinocular Research Microscope (Olympus BX 51, Japan). Twenty-five nonoverlapping intermediate mucosal epithelial cells with well-defined borders were randomly selected [Figure 3]. The images captured were stored in the computer, and cytomorphometric analysis was done using the software Image Proplus V-4.1.0.0 (Media, Cybernetics, USA). The cytological alterations such as nuclear-cytoplasmic area ratio, nuclear and cellular pleomorphism, abnormal mitotic figures and number of micronuclei according to criteria given by Tolbert et al. were evaluated using trinocular research microscope. The cytological alterations were then correlated with the salivary thiocyanate level. The observations were subjected to statistical analysis. Both parametric and nonparametric tests were used. Study groups were compared using Student's unpaired t-test. Tukey post hoc test was used for pairwise comparison. The correlation was done by Spearman's correlation coefficient. Salivary thiocyanate levels were found to be significantly higher (P< 0.001) in smokers (2.86 ± 0.58) compared to nonsmokers (0.67 ± 0.20). Comparison of salivary thiocyanate levels (mM/L) with pack-years among smokers showed a positive correlation with P < 0.001 which was highly statistically significant [Figure 4]. 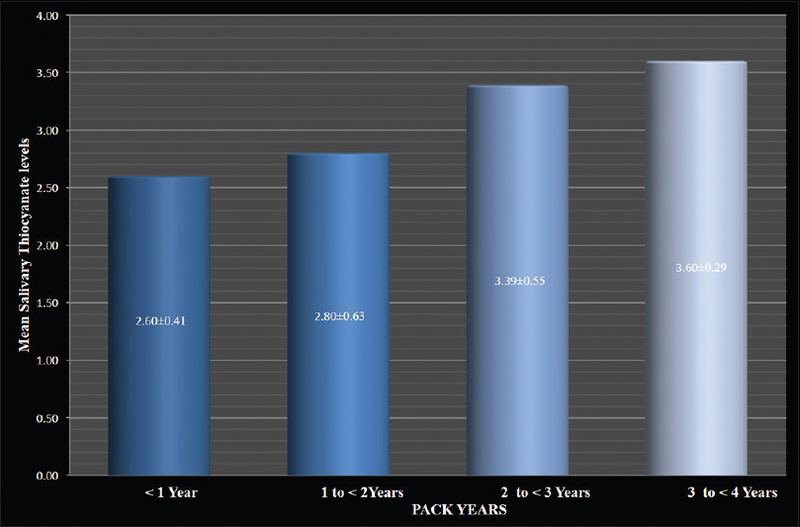 Group IV - 3 to <4 pack-years (5 cases). There was progressive increase in mean salivary thiocyanate levels as the pack-years increased [Figure 5]. Group E - 4 to <5 years (4 cases). Although there was a slight increase in the concentration of salivary thiocyanate levels with increasing duration of the habit, the result was not statistically significant (P = 0.01). Cytological alterations were assessed based on nuclear/cytoplasmic area ratio, nuclear and cellular pleomorphism, abnormal mitotic figures and number of micronuclei. The mean nuclear/cytoplasmic area ratio in smokers and nonsmokers was 0.028 ± 0.007 and 0.025 ± 0.003, respectively. The values showed a mean difference of 0.003 with P = 0.03 which was statistically significant. There was highly significant increase in number of micronuclei in smokers than nonsmokers. The mean number of micronuclei among smokers and nonsmokers was 6.94 ± 6.33 and 3.00 ± 2.51 respectively, with a mean difference of 3.94 and P < 0.001. Nuclear and cellular pleomorphism as well as abnormal mitotic figures were not found in both the study groups in the present study. Hence, the correlation of salivary thiocyanate levels was done only with two parameters, namely nuclear-cytoplasmic ratio and number of micronuclei. Spearman's correlation coefficient showed lack of significant correlation of salivary thiocyanate levels with nuclear-cytoplasmic ratio (r = 0.03 and P = 0.86) [Figure 6] and number of micronuclei (r = 0.10 and P = 0.59) [Figure 7]. Cigarette smoking is a serious health problem and a preventable cause of death. The risk of disease increases with increasing intensity and duration of smoking. Precise measurement of smoking is essential for identifying patterns of adolescent smoking behavior and for the evaluation of health education programs aimed at reducing or preventing the habit. Chemical measure of salivary thiocyanate shows accurate, quantitative information on smoking behavior. Thiocyanate, a metabolite product of cyanide is an anion found in organic and inorganic compounds. Salivary thiocyanate concentration in nonsmokers ranges from 0.5 to 2 mM with an average of 1 mM, but in heavy smokers, it may reach a level as high as 6 mM. The literature in the past has shown that the persons who smoke more cigarettes have higher salivary thiocyanate levels., Similar findings were noted in the present study. There was a progressive and statistically significant increase in mean salivary thiocyanate levels as the number of pack-years increased. 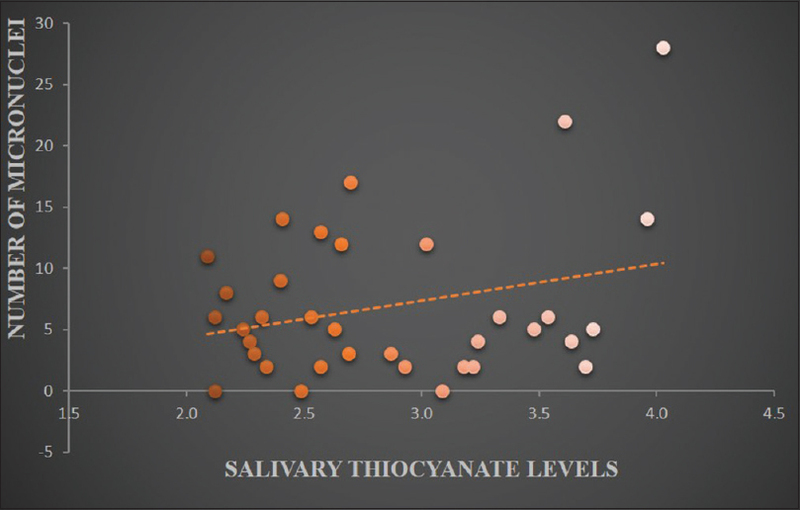 The relation of the duration of habit with salivary thiocyanate levels has not been reported in the literature so far. To compare the duration of habit with salivary thiocyanate levels, the cases were divided into five groups ranging from <1 year group to 5 years' group. It was observed that though there was a slight increase in the salivary thiocyanate levels with increasing duration of the habit, the result was not statistically significant. This suggests that the salivary thiocyanate levels are not as strongly associated with the duration of smoking as they are with the frequency of smoking. Previous studies have included heavy smokers who smoke more than 20 cigarettes a day for more than 10 years in contrast to this study. When cytological alterations were evaluated the nuclear/cytoplasmic area ratio showed an increase in smokers and no change in nonsmokers. Similar results were noticed by Goregen et al. who considered the cause of increased nuclear-cytoplasmic ratio to be a smoking-related adaptation by cells that might have been in progression to dysplastic change. Abnormal mitotic figures and cellular and nuclear pleomorphism which are among the accepted cellular and nuclear signs of malignancy were not found in either study group. This could be due to the reason that the samples were obtained from clinically normal buccal mucosa of smokers and nonsmokers. Furthermore, the fact that the study individuals were still young and habitual smokers with shorter duration of smoking and limited number of cells evaluated cytologically in the present study could have influenced this finding. This was in contrast to previous studies where the individuals were heavy smokers with longer habit duration., Luepker et al. found that salivary thiocyanate levels could discriminate between different smoking levels however it was not helpful in detecting very low-level smokers, such as experimenters or those smoking only a few cigarettes a month. Levels of salivary thiocyanate when correlated with the cytological alterations such as nuclear-cytoplasmic area ratio and number of micronuclei, revealed statistically insignificant result. Although thiocyanate has been found to have carcinogenic effects in the stomach , it failed to show significant cellular and nuclear alterations in the oral cavity, which may be explained by the differences in the local environment such as pH (acidic in the stomach and buffered to stay neutral in the oral cavity). This study has added to available knowledge by showing that in smokers, the total number of pack-years and not the duration of the habit is associated with a significant increase in the levels of thiocyanate. In addition, the study demonstrated a lack of correlation between salivary thiocyanate levels and cytological alterations related to malignant transformation in the oral mucosa. Thus, emphasizing the differences in effects of chemicals based on site variation. The study also once again proved the usefulness of salivary thiocyanate tests as an acceptable biomarker for smoking. This study was performed on a limited number of cells (25 cells) examined from each case for cytological alterations. A study with more cells is needed. Although few cytological changes were evident in early smokers, results were insignificant. A longitudinal study on the same individuals could be done to check if any cytological alterations develop at a later stage as the number of pack-years increase. A similar study can be done in individuals with longer habit duration to determine the role of habit duration. This may help in early intervention and prevention of further dysplastic changes. Studies to test accuracy to use salivary thiocyanate as a marker for smoker detection should also be considered. Salivary thiocyanate levels were significantly higher in smokers than nonsmokers and showed significant correlation with the number of pack-years. Although the present study failed to reveal any significant correlation between salivary thiocyanate level and cytological alterations, few early alterations in the oral mucosa even in the absence of clinical manifestations were detected by exfoliative cytology. Salivary thiocyanate determination is a safe, inexpensive, noninvasive method to differentiate smokers from nonsmokers. We would like to thank Dr. Preethi, Department of Biochemistry, J.J.M. Medical College, Davangere, Karnataka for her assistance in carrying out the study, Mr. Sangam. D. K. for statistical analysis, Mr. Mallikarjun, and Mr. Kumar, Laboratory Technicians, College of Dental Sciences, Davangere, Karnataka for their technical help. Sopori M. Effects of cigarette smoke on the immune system. Nat Rev Immunol 2002;2:372-7. Pasupathi P, Bakthavathsalam G, Rao YY, Farook J. Cigarette smoking – Effect of metabolic health risk: A review. Diabetes Metab Syndr Clin Res Rev 2009;3:120-7. Benowitz NL. The use of biological fluid samples in assessing tobacco smoke consumption. In: Grabowski J, Bell CS, editors. Measurement in the Analysis and Treatment of Smoking Behavior (NIDA Research Monograph 48). Maryland: Washington, D.C: U.S. Government Printing Office; 1983. p. 6-26. Stookey GK, Katz BP, Olson BL, Drook CA, Cohen SJ. Evaluation of biochemical validation measures in determination of smoking status. J Dent Res 1987;66:1597-601. Russell T, Crawford M, Woodby L. Measurements for active cigarette smoke exposure in prevalence and cessation studies: Why simply asking pregnant women isn't enough. Nicotine Tob Res 2004;6 Suppl 2:S141-51. Tsuge K, Kataoka M, Seto Y. Cyanide and thiocyanate levels in blood and saliva of healthy adult volunteers. J Health Sci 2000;46:343-50. SRNT Subcommittee on Biochemical Verification. Biochemical verification of tobacco use and cessation. Nicotine Tob Res 2002;4:149-59. Cytology and the Diagnosis of Neoplasia; 2011. Available from: http://www.walthamusa.com/articles/wellman.pdf. [Last accessed on 2011 Nov 05]. Pack Year; 2011. Available from: http://www.en.wikipedia.org/wiki/Pack_year. [Last accessed on 2011 Oct 18]. Tolbert PE, Shy C, Allen, JW. Micronuclei and other nuclear anomalies in buccal smears: A field test in snuff users. Am J Epidemiol 1991;134:840-50. Luepker RV, Pechacek TF, Murray DM, Johnson CA, Hund F, Jacobs DR, et al. Saliva thiocyanate: A chemical indicator of cigarette smoking in adolescents. Am J Public Health 1981;71:1320-4. Cherubini K, Lorandi CS, Krapf SM, de Sousa FR, Yurgel LS, Figueiredo MA, et al. 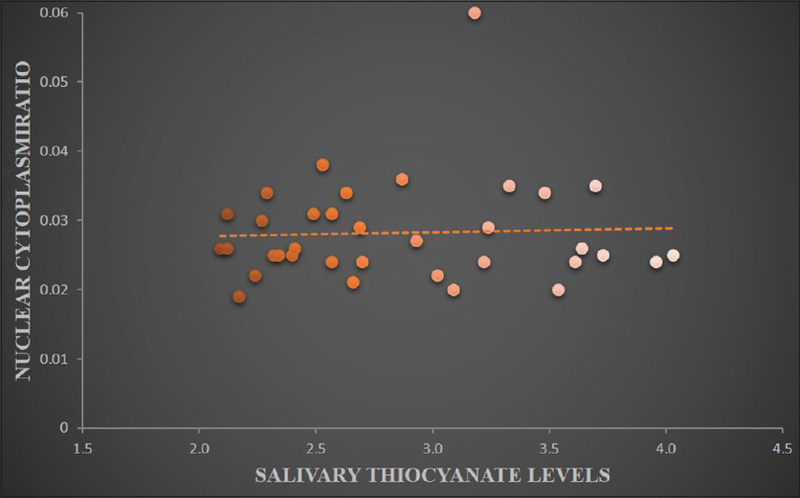 Association between recurrent aphthous stomatitis and salivary thiocyanate levels. J Oral Sci 2006;48:153-6. Joergensen KA, Lawesson SO. Studies on the reaction of nitrosyl cation with thiocyanate anion using energy-weighted maximum overlap and ab initio calculations. J Am Chem Soc 1984;106:4687-91. Ruddell WS, Blendis LM, Walters CL. Nitrite and thiocyanate in the fasting and secreting stomach and in saliva. Gut 1977;18:73-7. Haley NJ, Axelrad CM, Tilton KA. Validation of self-reported smoking behavior: Biochemical analyses of cotinine and thiocyanate. Am J Public Health 1983;73:1204-7. Windsor RA, Cutter G, Morris J, Reese Y, Manzella B, Bartlett EE, et al. The effectiveness of smoking cessation methods for smokers in public health maternity clinics: A randomized trial. Am J Public Health 1985;75:1389-92. Zamani AG, Durakbasi-Dursun HG, Demirel S, Acar A. Evaluation of smoking genotoxicity in Turkish young adults. Indian J Hum Genet 2011;17:7-12. Salehinejada J, Kalantarib MR, Omidic AA, Zared R. Evaluation of AgNOR staining in exfoliative cytology of normal oral (buccal) mucosa: Effect of smoking. J Mash Dent Sch 2007;31:22-4. Langman MJ, Doll R, Wilson J. Plasma and salivary thiocyanate in gastric cancer. Gut 1966;7:549-52. Hegde S, Chatterjee E, Rajesh KS, Kumar MS. Estimation and correlation of salivary thiocyanate levels in periodontally healthy subjects, smokers, nonsmokers, and gutka-chewers with chronic periodontitis. Indian J Dent Res 2016;27:12-4.